When the HMMWV, AKA the Humvee, AKA the military version of the Hummer, first came out, people thought it was unstoppable. Then the wars of Afghanistan and Iraq happened, and it proved extremely vulnerable to everything from improvised bombs to mines to bullets. 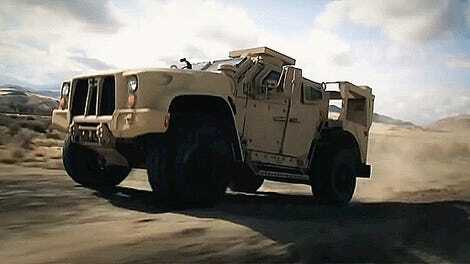 So this mean-looking thing is what the original maker of the Humvee has come up with as an upgrade. 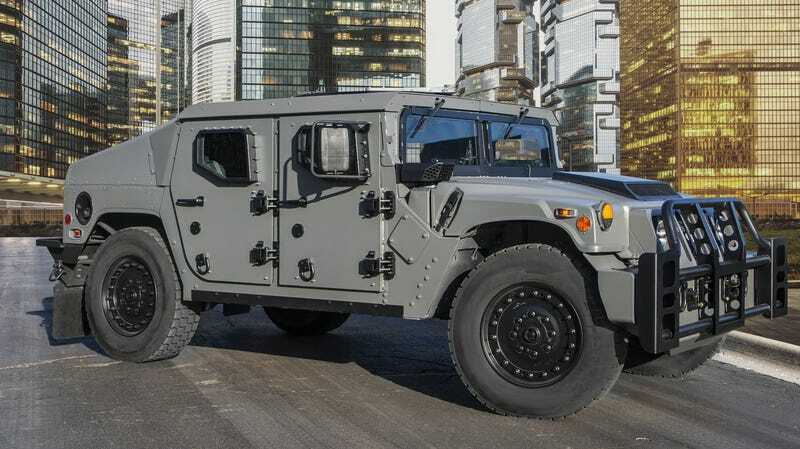 AM General unveiled what its calling the NXT 360 at the Eurosatory trade show in Paris, which is a bit like SEMA except if many of the clientele were just various warlords and arms dealers. And the NXT 360 is quite an upgrade from a regular Humvee, which made its debut 34 years ago. To help it drive offroad even better, it gets bigger wheels and tires, more ground clearance and wheel travel, increased approach and departure angles, and AM General even claims a “significant ride improvement.” It also boasts more powerful air compressors than in the original Humvee, enabling it to lower and raise its tire pressures more quickly, to help transition from on-road to off-road environments and back more quickly. Instead of using terrifyingly thin metal plate as the body work, the NXT 360 follows the precedent of many of its up-armored cousins that eventually featured in Afghanistan and Iraq, coming with B7-level protection, or enough armor to stop an AK-47 round from any direction. Even the windows are claimed to be bullet resistant. So to help its occupants survive blasts a bit, the NXT 360's front wheels are rated up to level Stanag 2a, or enough to resist a 13.2-pound anti-tank mine, and its rear wheels should be able to survive a blast from a hand grenade. It’s also got blast seats and mats, to hopefully prevent any shrapnel and concussive forces from spraying the occupants inside. Plus anti-lock brakes and stability control, because it’s 2018. That thing with the big friendly face is the Oshkosh L-ATV, which got its catchy name from the acronym of “Light Combat Tactical All-Terrain Vehicle.” It was designed from the beginning to fight in the weird wars we have today, rather than being an adapted model from an existing design like the NXT 360. 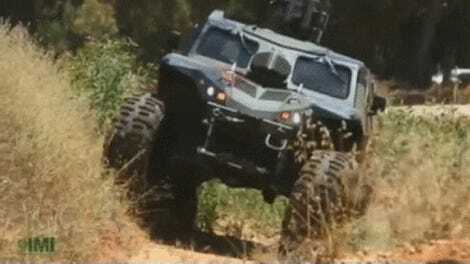 But if you can’t afford the $250,000 to $559,000 for an L-ATV, a NXT 360 make work nicely. Oh, and just in case, AM General is also peddling what it calls the HMMWV Hawkeye 105mm Weapon System at the Eurosatory show. In case it was hard to figure out from the name, it’s a Humvee with a giant Howitzer on the back.